Monoia is an English movie club that inspires change in girls’ minds, hearts and ways of life for a colorful future. Navega is an organic community garden that strives to bring happiness to the world through healthy food. Talk With Me is a culture club that creates a fun, safe space for students to practice English and build the confidence to achieve their dreams. G.O.L.D. (Go On With Learning Development) is a group of higher education advocates who work to transform the mindset that girls don't need to go to school. They mentor and inspire young women in rural villages to finish their secondary education, go to university and be successful. We visit the homes of two students to better understand where they come from and what they’re up against. We meet their families, visit their primary schools, walk through their villages and listen. We learn that most friends don’t have the funds to finish secondary school, that their siblings work in factories or in the family rice field, that both young women are studying hard to avoid those options. Despite little family support, they are the first in their villages to go to university. Every day, they feel the pressures of getting a job to avoid factory work or returning to their village to get married off. On a very warm day, we meet all 23 young women at a university classroom in Phnom Penh. We start with an individual post-it exercise that reveals their motivations, hopes and challenges. The majority are driven to study hard and get good jobs to support their families. They all want to succeed and prove to the people back home that girls deserve to go to school. That's the only way to change traditional perceptions. Each group begins ideation for their club. They identify a problem in their community, survey the campus to assess the need and come up with a solution. Key problems that emerge are the lack of opportunities to practice English, little access to affordable, healthy food and traditional beliefs that prevent families from supporting girls’ education. Many of these young women don’t see themselves as leaders despite everything they’ve accomplished. Each creates a collage that expresses why she is a leader. It’s their first time collaging but quickly realize that anything is possible. Each group works on a club name, logo, vision statement, marketing and financing plan. Challenged to present their club in a creative way, they come up with the most hilarious, awesome performances. Then, its time to visually translate their action plans for the zine. 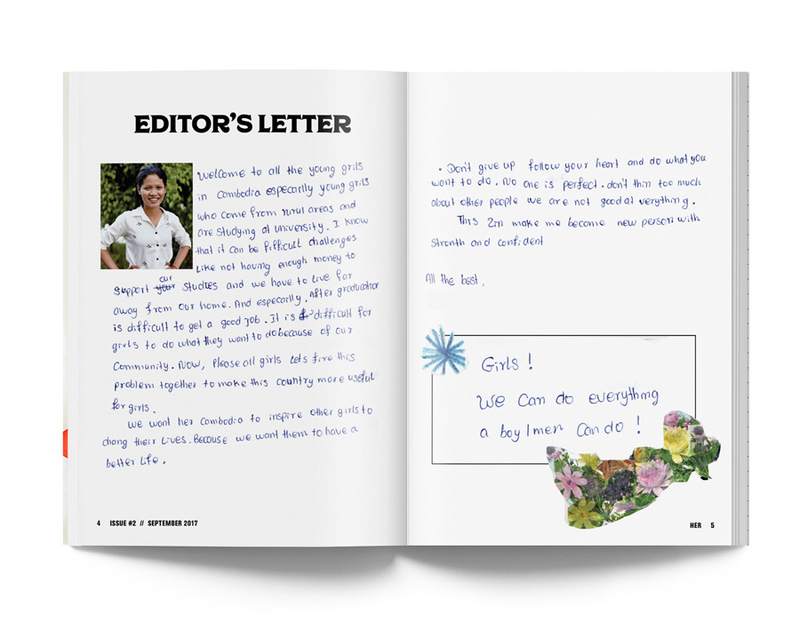 Together, we assemble the zines - a remarkable physical manifestation of their vision, teamwork, and actions for positive change. Their response when they finally see the first assembled zine? “Wow, we did this! We can make a difference." "I know it can be difficult - like not having enough money for our studies and we have to live far away from home. And especially, after graduation, it is difficult to get a good job. It is difficult for girls to do what they want to do because of our community. Now, please girls. Let’s fix this problem together to make this country more useful for girls. Don’t give up. Follow your heart and do what you want to do."